Shown in this diagram, the benefits of having Radiator Covers is to project more heat into the center of the room. This gives the room better heating. Radiator Enclosures also protect children from burns, plus they beautify your home from unsightly radiators. You will never have to paint your radiators ever again. 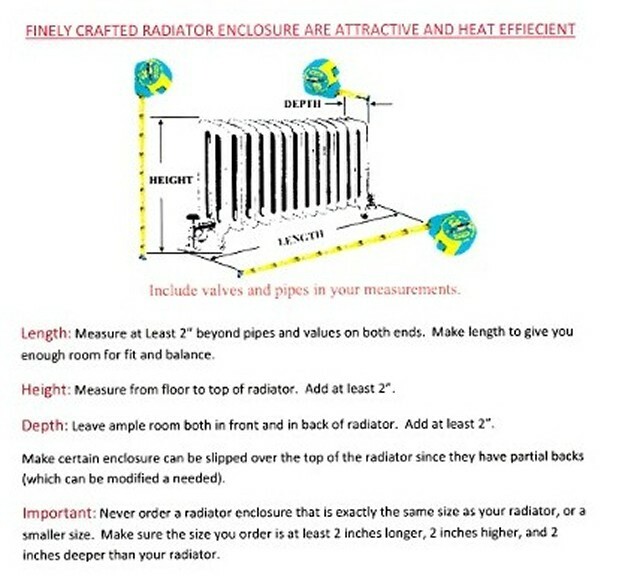 Enclosures correct exposed radiator heat looses by directing heat increasing room temperature 1.5 degrees! Source: proven test by the University of Illinois. Radiator Enclosures protect children and adults from contact with exposed hot radiators and pipes. Used in hospitals, daycare centers, nursing homes, institutions, offices and homes. Radiator Enclosures control radiator dust and soiling. Room painting, wallpaper, plaster, drapes, and furnishings, retain their new look longer. Enclosures eliminated direct back wall heat rise associated with airborne dust and grim accumulation. Radiator Enclosures are available in steel for best heating performance. Available in many colors. Painting exposed radiators insulate and reduce heat efficiency up to 15%. By leaving your radiators exposed you have uncontrolled heat loss through walls, windows, and ceilings. Dozens of ready made sizes save you up to 50% over usual made-to-order size. We have made buying radiator enclosures affordable and economically priced. Your savings in fuel dollars will pay for the radiator enclosures in the years to come. Here's a way to improve heat beautifully at low prices. Prices will never be lower - materials and labor costs are always on the rise!